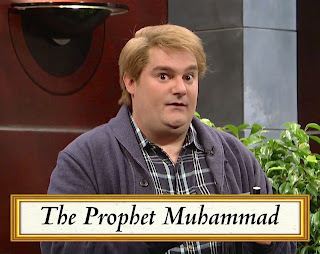 Bobby Moynihan in "Picture Perfect"
Saturday Night Live has featured Jesus in numerous sketches (see here and here for examples). But no one on the show has ever dared to don a Muhammad costume. That's not likely to change, as any cast member involved in a sketch about Muhammad would be forced into hiding. If you'd like some references, just ask Salman Rushdie, Theo Van Gogh, Lars Vilks, Molly Norris, Stéphane Charbonnier, Jean Cabut, Philippe Honoré, Bernard Verlhac, and Georges Wolinski what life is like after criticizing Muhammad. But SNL did the next best thing, by drawing attention to the fact that people are so terrified of drawing Muhammad, they wouldn't do it for a million dollars. Reminds me of Mel Brooks and The Producers. He said the best way to treat Hitler was to make fun of him. The SNL skit did just that to the ridiculousness of not being able to draw the Poptart Mohammad. There is nothing fear but fear itself. ISIS also smiles seeing Muhammad's picture perfect abstract cartoon drawn at "Saturday Night Live". There will be no FATWA to kill them because no pictures were drawn. Thanks SG, I am outside the US.